Thank you for driven concept about teaching our youth players how to hit and play ball. Since Cameron has came to your program he is actually hitting the ball and hitting the ball hard. This is his 3 season playing and he has not been a good batter. That brings a players conference down. He has had 6 sessions with you and I see a athlete that is hitting the ball now and is very confident at the plate. When it's 3 and 2 count I don't worry anymore that he is going to strike out and now he hits harder because he focuses better on the ball instead of his mechanics. The skills of batting along with teaching them how to focus and to drive under pressure is amazing. Cameron is hitting line drives and 1 hoopers to the fence and soon they will be going over the fence with our future lessons. Thank you so much for bringing your knowledge of the game to our kids and to follow them in your mentoring program. Cameron will be a part of that till he goes big. Thanks to you. I just wanted to say WOW what a difference the right kind of hitting training and personal motivation has made on my son Luke after just a few training sessions with Brent Lillibridge...We will continue to work with Brent for a long time. In just a few sessions with Lillibridge Athletics both kids improved by leaps and bounds. [Brent] has helped [my daughter] get rid of the “chop” in her swing and in turn she is smashing the ball during games and even won the homerun derby. My son is now hitting line drives up the middle and into the gap. His confidence, attitude, leadership and pure love of playing the game of baseball is completely contagious and fun to watch. "My son Ryan has been working with Brent and Base By Pros for about 3 mos. now. He has worked very hard with him both in the field and with his hitting. As someone who coached for almost 20 years myself I am very picky on who coaches my kids as I know there are many bad coaches or mentors out there. Brent has done a tremendous job of 1) Finding out Ryans goals and 2) Helping him come up with a plan to reach those goals. The way Brent relates to players is both very informative and also more importantly engaging in a way that the players themselves enjoy. Ryan enjoys working hard, and is very driven, but with the amount of work they are doing, if it wasn't done in a fun way, it would get old and tiresome. I never get that feeling when Ryan works with Brent. It has been great to be able to turn him over to someone so knowledgeable that also has a heart for the kids dreams and well being. We wanted to thank you for the great work with Kyle this Fall. It’s been awesome for him to get very focused, high-level hitting instruction and also get some great lessons on goal-setting that goes beyond baseball. He’s been a solid hitter but you immediately pointed out some improvements that will help him really maximize every swing and get even better results. We’re excited for next season to start to see the results on the field! I have been in an instructor and a coach of select baseball for the last 20 years, having been a player at the collegiate and professional level myself, I understand what it takes to make it to the next level. I've had the pleasure of working with Mitch Canham when he was a junior at Lake Stevens High School. 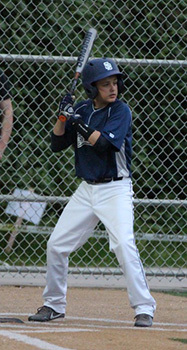 Mitch's dedication to the game of baseball and the community was already a priority for him when he was 16 years old. It has been a gift to be able to watch him grow into the player and coach he is today. Mitch's incredible work ethic as an athlete, mentor, and student, is second to none. Mitch's unparalleled passion to help kids achieved their goals is rare among men of his stature. Mitch has the knowledge and unique ability to get kids to understand what needs to happen in order to achieve their goals. His development of the Base by Pros website a testament to his commitment toward helping kids achieve their dreams. I have work with Brent Lillibridge as a fellow instructor on and off for the last eight or nine years. We work together instructing teams in the winter during his offseasons. Brent is an unbelievably gifted player and coach, his knowledge of game, hitting and fielding is spot on and second to none. Since his retirement from professional baseball. Brent has joined forces with Mitch Canham and the Base by Pros staff and helped them expand their presence in the high schools and local select teams. Brent's passion for mentoring the youth of this area makes him an incredible asset to our community as well as a being great man. Brent's commitment to delivering the truth of how to hit and play the game is truly remarkable. His understanding of how the sequence of the swing goes together and his vision to decipher the swing, allows him the ability to make the appropriate corrections, that most instructors miss or know that they are flaws. I retired from instructing kids privately about 10 years ago in order to focus my time on coaching my two sons and their teams. 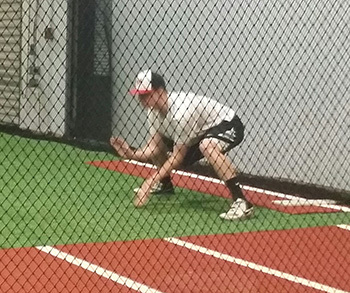 I have spent countless hours working with my children to further their skills as hitters and infielders. The knowledge I have gained over the years through coaches I have played for and research I have done to further my knowledge, make it difficult to find an instructor that instructs the true major league way of hitting. My trust of someone to teach my boys the proper mechanics of the swing, must be absolute. Over the years I have researched studied and had discussions with many reputable instructors. Through it all I have found varying degrees of opinions on what makes a good swing MLB swing. I have found very few that I trust to teach my sons. Two of them live on the east coast, and make it impossible to work with. Brent and Mitch are the only two in the area that I trust to work with my boys, and I refer them to the players on my teams, and to any of my friends that have children that are looking for instructor. Brent, Mitch, and Base by Pros staff have the unique ability and tools to allow players to achieve their goals no matter whether it be to make a little league team, make the All Star team, make a select baseball team, make the high school baseball team or have the opportunity to play college baseball and beyond. These outstanding men have established a system to keep you accountable and on track to reach your goals through their mentorship, goal setting, and discussion they have outside of the lesson time is what separates them from all the other instructors around. In my opinion you can't find a better program or two better men to work with your children or teams. My son, Coby, has been training with Brent since March/April 2015. He was interested in taking his baseball game to the next level. Brent Lillibridge came highly recommended to us by Mitch Canham. Brent’s honest and direct approach to training not only prepares athletes to play/compete at a higher level but also provides them skills they need in order to be successful in life. Brent’s training has had positive results on Coby by challenging him to excel at school and in baseball through hard work, commitment, and setting realistic goals. 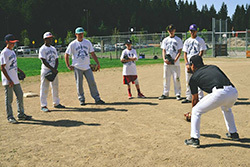 Since training with Brent, Coby has improved his performance in school and increased his skills in baseball. If you are looking to provide your child with well-rounded skills to succeed in baseball and in life, I unequivocally recommend Brent Lillibridge. We want to say thank you to Brent and Mitch for working with our son Logan over the last several months. They are not only teaching baseball skills and lessons, they are teaching life skills (such as goal setting) that will serve him no matter where life may take him. Their ability to bring the lessons down to a 10 year olds level has been really important because it make it more than just lessons, it makes it fun, and Logan looks forward to seeing them each week. The season is still a ways off but we look forward to seeing what the results will be after this offseason of work. We look forward to continuing to work with both Brent and Mitch.